Wes turns three in July, and by August, he’ll need to be fully trained to move up to the 3’s classroom. I’m confident we’ll get there in plenty of time, but I do have a deadline looming over my head. And I’d really like to have this nailed down before our July vacation. So here we go! I’m a researcher and a planner; here’s my personal goals and outline. 1. Take a readiness quiz. CHECK. Or two or three. Wes is certainly intellectually and physically ready for potty training, but he shows no interest at all. We’ve had a potty chair for months, and he’ll occasionally sit on it, clothed. We have watched DVDs, listened to potty CDs and read books galore. He loves flushing the toilet and “helping” others complete all the steps in the bathroom, but refuses to potty in anything but a diaper. And he doesn’t seem to mind when it’s wet and hanging low. Two of the books I’ve read are Potty Train Your Child in Just One Day and The No-Cry Potty Training Solution. For the last 9 months, we’ve been watching Signing Time’s Potty Time DVD and listening to the music in the car to the point of memorization. Wes has always loved the Baby Signing Time series, so it’s an easy sell. Outside of random google searches, I’ve also found some good tips and resources at pottytrainingconcepts.com. 3. Decide on a plan of attack. CHECK. 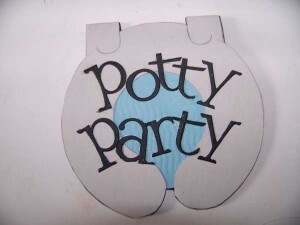 I wasn’t sure I’d be sold on the Potty Party idea until I finished reading. I wouldn’t say I’m totally sold on everything they recommend, but considering Wes needs enticement to try anything new, we can make it a fun experience. He’s super cautious about change – I mean, he was nearly 10 months old before he rolled over – and the subtle introduction of the potty chair isn’t cutting it. He also loves our undivided attention, and this plan gives him my entire being for a full day…it just happens to be spent mostly talking about and being in the bathroom. Currently I’m deciding on which training doll/stuffed animal will be best, if and what theme this party should be and all the entailing details. I feel like parents can get way out of hand here and spend oodles of money on this process. Haven’t kids been trained for generations without all the fluff? Anyway, my current thinking is a Thomas & Friends themed party complete with decorations around the house, themed foods and drinks and games. Too bad Thomas is a train and doesn’t need to be potty trained. I doubt they have an episode on leaking tar… BUT, Potty Time/Signing Time does have a frog named Hopkins that is trained in the DVD. They also sell a Hopkins plush toy with a pair of underpants, and Wes would get a kick out of teaching Hopkins to potty by himself, doubling as a new toy. I really need to plan this out so I’m not going broke on supplies. 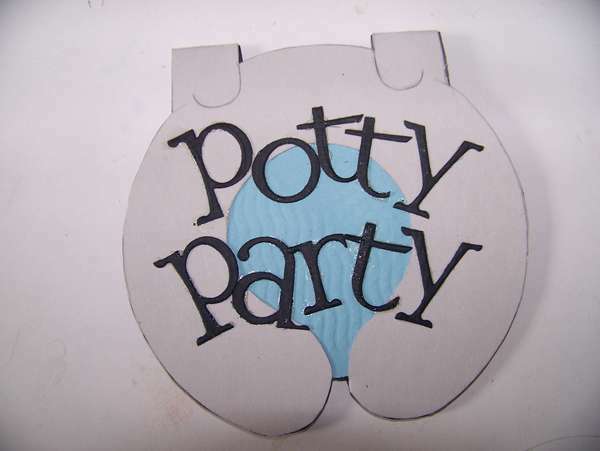 You might be asking, what the heck is a potty party? I really didn’t know, either. Basically it’s a full day you put aside to celebrate a changing lifestyle. You can be as creative as you like, but typically it envolves introducing a doll to the potty chair and experiencing accidents with this toy so that a connection is made within the child. The toy is trained in the morning – going to the bathroom and having accidents for several hours until the toy continues to have a dry pair of underpants. The afternoon is spent training the child to do the same. Experts claim this can be done in a few hours. The party aspect is overly celebrating all achievements. I’m purposely planning Party Day to fall on a Friday that I take off work so that I have the remainder of the weekend to maintain a schedule and stay indoors. They say it takes about 3 weeks to form a habit, so maybe within a month’s time we’ll have this thing in the books as a success with few accidents! I have 4 weeks to get everything ready and gear myself up for this “party.” You can probably tell I’m still a little skeptical, but I think it will work. Steven will be out of town that weekend, so he won’t have any available ways to make fun of my celebratory tactics! Do you have any words of wisdom or “if it doesn’t work, try this” scenarios for me as I embark on this journey? Thanks in advance!